This individually built Detached Bungalow is located on the site of the former Renfrew railway station, conveniently tucked away on Double Dykes Lane at Fulbar Street. The well appointed all on the ground level accommodation has been presented to the market in excellent order throughout. This superb family home is centrally located to town centre amenities on a generous plot with mature gardens surrounding the property. The accommodation comprises of: Hallway, dual aspect Lounge laid out with hard wood flooring, Kitchen incorporating a breakfast bar, range cooker with gas hob, extractor, integrated fridge freezer and dishwasher, a double glazed Conservatory, four well appointed Bedrooms, including fitted mirror robes in Bedroom one, a four piece Bathroom enhanced by a luxurious jacuzzi tub and separate shower cubicle. There is also a useful Cloakroom W.C. This well presented family size home is offered in neutral tones throughout. The property specification includes a system of gas central heating and double glazing. The property sits on a generous plot with mature gardens on all sides. The gardens are laid out with sections of lawn, decking and a pond feature. There is an ample driveway which offers off street parking for multiple vehicles. At the end of the drive there is a large garage with power and useful attic space for storage. Double Dykes Lane is ideally located close to the many amenities on offer in Renfrew town centre, which is only a short walk away. Intu Braehead is also close at hand offering a rich variety of retail and leisure activities. Local schooling is readily available, both at primary and secondary levels. Local transport links are good with regular bus services serving the area and quick and easy access to the M8 Network. Early viewing will be essential. 'Lismore' is a desirable Detached Bungalow which has been professionally extended to form a substantial five bedroom family home. The attractive property offers spacious and flexible living formed over ground and attic level within a generous manicured plot. The traditional property is located in an established residential pocket of Johnstone overlooking Thomas Shanks Park. The ground floor extends to: Entrance Vestibule, Hallway, bay window Lounge complete with log burner, rear facing Dining Room, open plan Kitchen/Dining/Family Room featuring a Smeg range cooker with gas hob and extractor hood, integrated fridges and dishwasher, a Utility Room, a tiled Shower Room and two double Bedrooms. The converted attic space houses a further three Bedrooms and a stylish four piece Bathroom with a modern white suite and separate walk in shower. The property is presented to the market in excellent decorative order throughout. The specification includes gas central heating and double glazing. French doors in the Family/Dining Room lead to a raised timber deck overlooking the manicured back garden. The front garden is mainly laid to lawn but also features a chipped driveway. This Detached Villa has been extended by the current owner over two levels to create a well appointed family home on an excellent layout. The attractive property is located in this desirable modern development at King George Place, close to Renfrew town centre. The accommodation is offered to the market in excellent order throughout. The lower level comprises of: Entrance Vestibule, Lounge complete with feature fireplace, Dining Kitchen incorporating a range cooker with a gas hob, Dining Room with French doors onto the garden, a Utility Room and a Cloakroom W.C. The upper level extends to: four good size Bedrooms, En-Suites in Bedroom one and two, and a Family Bathroom enhanced by a modern white three piece suite and shower. There are fitted mirror wardrobes in Bedrooms one, two and three. The impressive property has been well presented throughout. The ground floor with the exception of the Utility Room benefits from karndean flooring. The property specification includes: gas central heating and upvc double glazing. At the front an ample mono-bloc driveway leads to an integral garage. The enclosed back garden is landscaped with decking, paving and lawn. Renfrew town centre is within easy reach of King George Place and there are a variety of amenities on offer including shops, banks, a post office, bars and restaurants. Local schooling is readily available both at primary and secondary levels. For the commuter the M8 Network is on the doorstep providing quick access to Glasgow City Centre, the West End, Glasgow Airport and further afield. Intu Braehead is also minutes away for a good choice of retail and leisure activities. 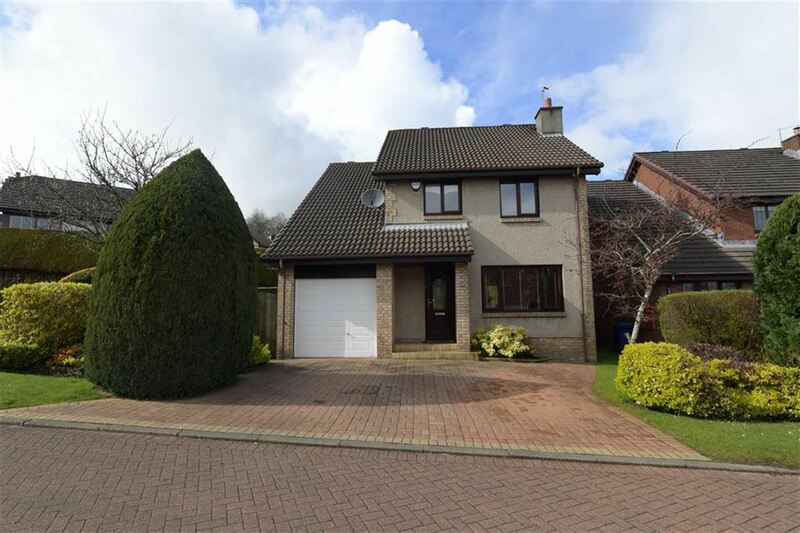 This modern Detached Villa occupies an elevated position within the desirable cul de sac of Sandielands Avenue in Erskine. The landscaped plot backs onto a wooded area and faces out to the front over the Kilpatrick Hills and the River Clyde. This immaculate family home offers accommodation formed over two levels including a converted garage space. The accommodation on the lower level comprises of: Entrance Hallway, Lounge, Dining Room featuring French doors, Kitchen incorporating a variety of wall and base mounted units and a Zanussi cooker with induction hob, Utility Room and a recently upgraded Cloakroom W.C. There is also a converted garage space on the lower level which could act as an additional public room or bedroom. The upper level extends to: four well appointed Bedrooms and a tiled Bathroom complete with a modern white suite including a larger style tub and electric shower. There is a tiled En-Suite with shower facilities in Bedroom one. Bedroom one and two feature fitted mirror wardrobes. The immaculate property is offered in fresh neutral tones throughout and features a range of modern floor coverings. The excellent open aspects are particularly good from the front facing first floor rooms. At the back the garden is split level and set out with paving, shrubbery and astro grass. There is a generous mono-bloc driveway to the front allowing for ample off street parking. Further benefits include: gas central heating and upvc double glazing. Sandielands Avenue is positioned in a quiet pocket of Erskine within easy reach of local amenities at the nearby Bridgewater Shops. Erskine itself offers a wide variety of amenities including shops, public transport links and local schooling at both primary and secondary levels. Intu Braehead, Glasgow Airport and Glasgow City Centre are all easily accessible via the nearby M8 Network.